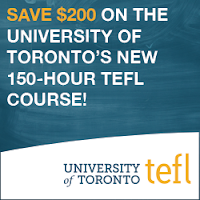 The University of Toronto has a new online 150-hour TEFL certification course. To celebrate they're offering $200 off during the month of November. Simply use promotion code "TEFL150". Offer ends midnight November 30th, 2013!